The language of heraldry is extensive and this glossary of heraldic terms and their meanings does not claim to be complete. If you want to know the difference between 'couchant' and 'sejant', or ever wondered what an 'opinicus' is, read on. Affronté - walking creature set full face. Ambulant - used of animals etc when walking. Animé - describes animal with eyes of different tincture to the rest of its body. Armed - most animals and birds with teeth, tusks, horns, talons of a different tincture to the rest of their bodies. If it has tail, a different tincture, it is queued. If the tongue is a different tincture, it is langued. At Gaze - used for example of a stag, when standing. Attired - as 'armed' but used of stags and antelopes. Barbed - an arrow with the head of a different tincture to the shaft. Barded - horse when wearing ornamental covering or trappings (caparison). Belled - used generally of a hawk with bells attached. Cabled - twisted around by a rope. Caboshed - beast's head shown full face without neck showing. 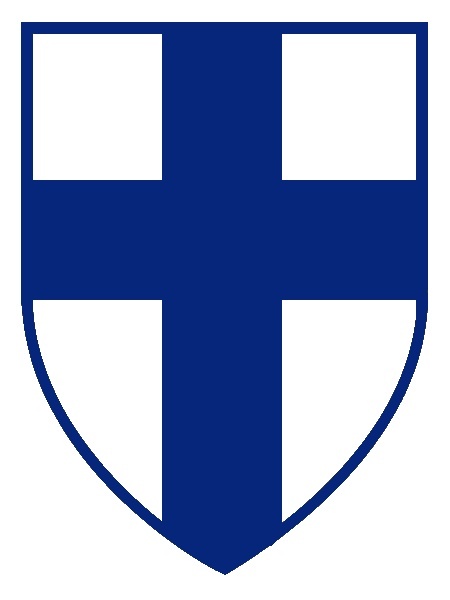 Cantonné - with cross shape (saltire) between four charges on a shield. Combatant - two wild beasts facing each other if rampant and counter rampant. Confrontant - as above of creatures other than wild beasts. Cowed - (coward) with tail between hind legs, pointing forward. Defamed - beast with tail removed. Embrued - dripping with blood. Endorsed - placed back to back (sometimes addorsed). Fructed - in fruit or bearing seeds. Incensed - beast with fire issuing out of its mouth or eyes. Jessant - shooting forth, springing up, such as flower. Passant - a beast walking with dexter paw raised. Queue Nowed - tail twisted into a knot. Rampant - animal rearing on hind legs. Regardant - animal looking backwards (see National Association of Goldsmiths) - unicorn supporters are regardant. Salient - a wild beast leaping forward. Apre - bull with the tail of a bear. Avellane - filberts (hazelnuts) in their cups. Bagwyn - heraldic antelope with long horns curved over the ears and a horse's tail. Bezants - circular gold disc shapes (roundels) in other tinctures have different names such as golpes (purple) and plates (silver). Billet - small oblong figure as in the shape of a short thick piece of wood. Birdbolt - a blunt headed arrow. Brocket - a young stag. Caltrap - spiked object thrown on the ground to obstruct the progress of cavalry charges. Cimant - a saliant goat. Chough - black bird of the crow family. Goutes - tear shaped drops, described as according to tincture such as d'eau (silver), d'huile (green). Mask - head of lion or leopard shown caboshed. Mullet - star with five points, centre pierced, representing rowel of a spur. Opinicus - hybrid animal being a lion with a short tail, front part and wings of a dragon and head of a griffin. Panache - plume of feathers, usually differently tinctured. Accolée - A pair of shields placed side by side, bearing different arms, e.g husband and wife. Alternative to impaling. Impaling - Two arms on one shield. The simple form is both shown arms in entirety, but also means half of one arms on one half and half of the other arms on the other. For centuries before the beginnings of what we call heraldry, badges or symbols were used as tribal signs. The tribal warriors would carry shields decorated with these signs when they went into battle. Later important individuals developed their own personal insignia. Bar - horizontal band across the shield, taking up one fifth of the field. 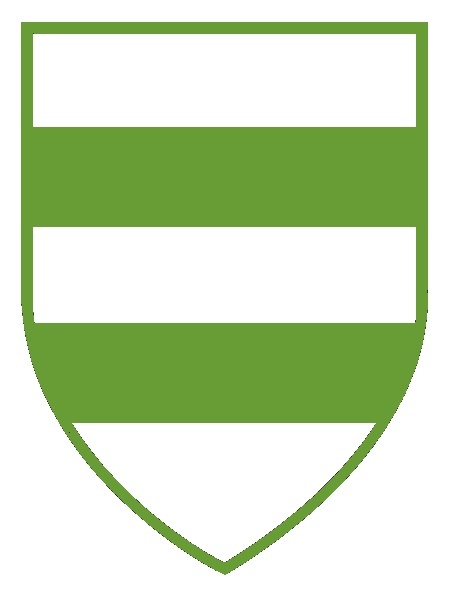 Barry - shield divided by an even number of horizontal lines, the number of divisions specified. Bend - a broad diagonal band which takes up one third of the field (generally drawn from dexter chief to sinister base as the reverse denotes bastardy). 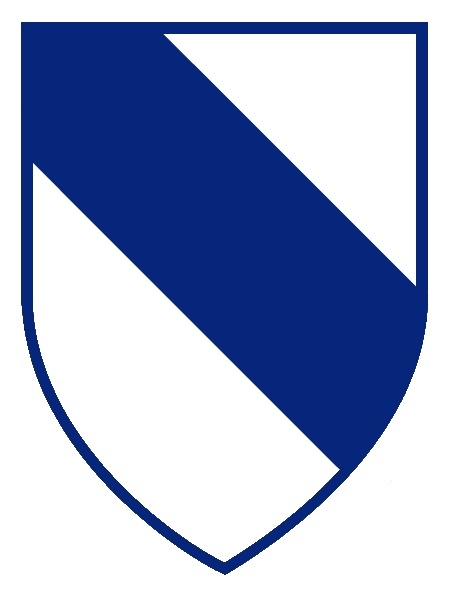 Bendy - shield divided by diagonal lines in the shape of the bend but narrower. Chequy - (also checky) a field or charge divided into squares by horizontal and vertical lines, these squares being alternately metal and colour. 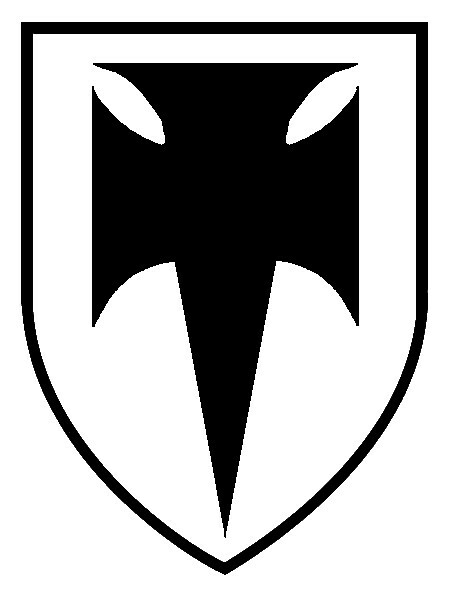 Chevron - inverted V-shaped band rising from dexter and sinister side of shield to meet in the middle. Should occupy one third of the shield. 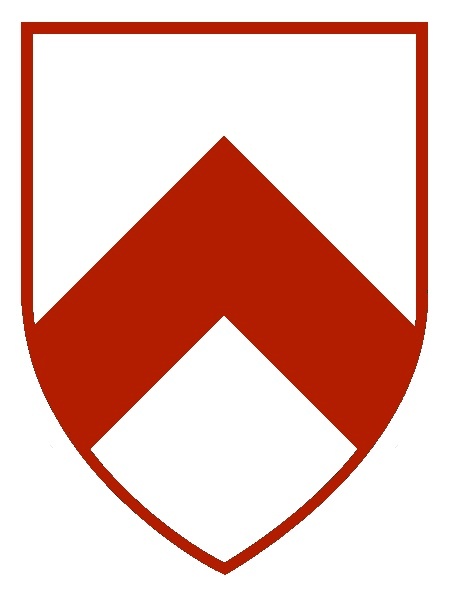 Chevronnel - as chevron but half width. 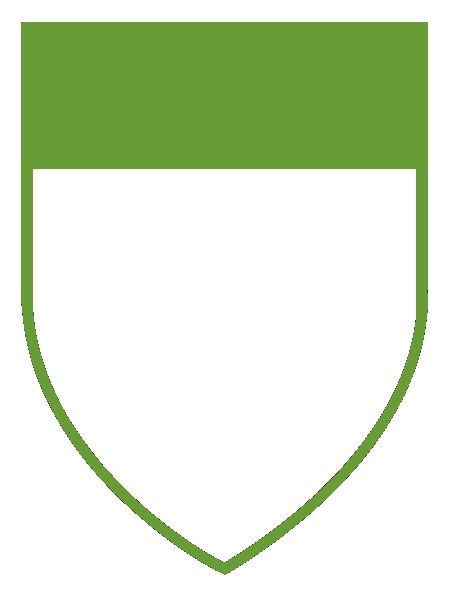 Chief - broad band across the top of the shield. Crenelated - decorated as battlements of castle, alternate depressions and square projections. 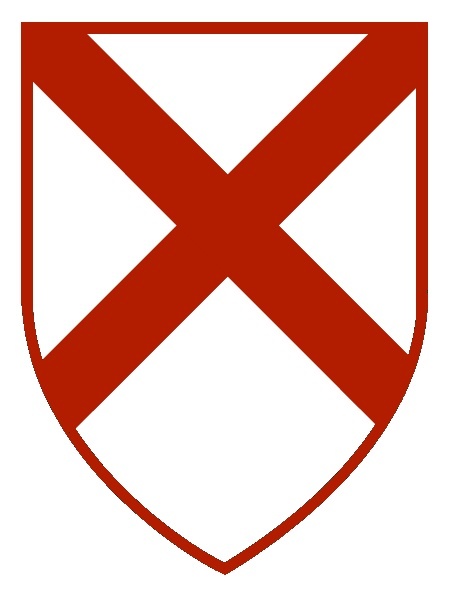 Cross - This basic cross shape is placed in the centre of the shield with arms extending to the sides. 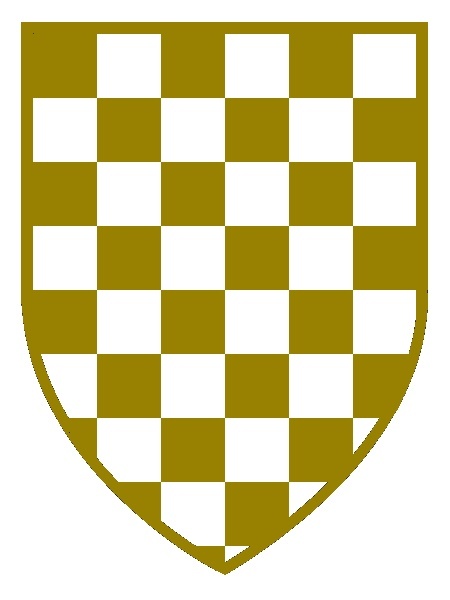 There are dozens of variations of the cross and the way it may be seen in heraldry. For example, a cross is said to be couped if the arms do not reach the edges. If each of those arm ends are splayed into triple points it is known as a cross patonce or if each ends in a ball as cross pommy. Fitchy - used of crosses with spikes at the end. 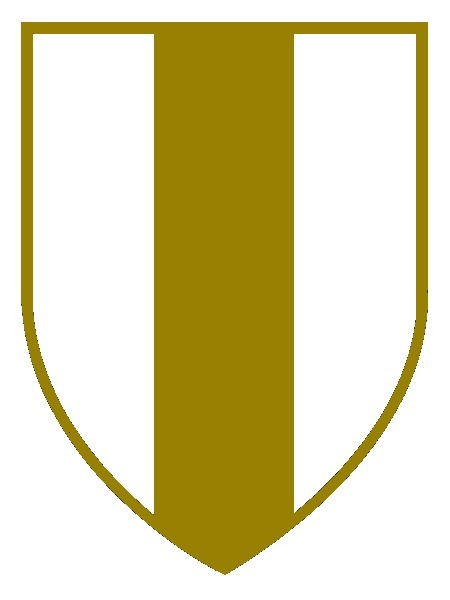 Pale - a vertical band occupying the middle of the shield, being one third width. Saltire - a diagonal cross.